PCC30-60W Series are a range of 30W to 60W RoHS compliant, single output, constant current led drivers, of non waterproof design, with quick connect terminals suitable for indoor LED lighting applications. 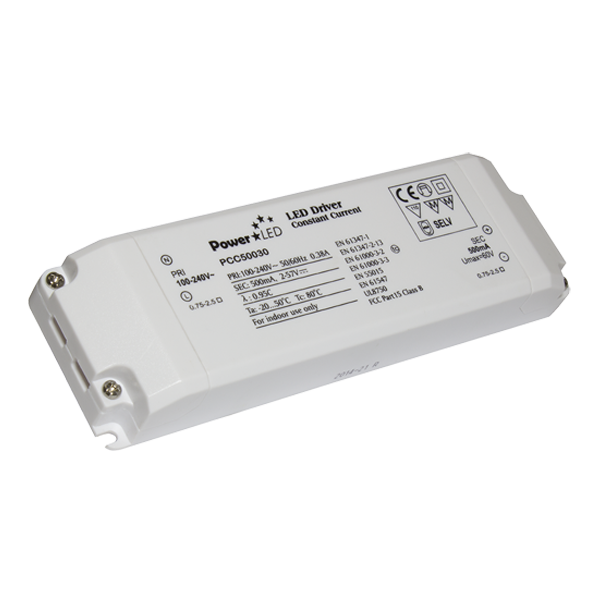 PCC30-60W Series are a range of 30W to 50W, RoHS compliant, single output, constant current led drivers, of non waterproof design. The units are suitable for direct mounting on normally flammable surfaces, such as wood, and can be installed inside a wooden cabinet if minimum mounting distances are observed. Other standard features of the range include protections against over load, short circuit and thermal to 110°C, across the whole surface of the unit. These Class II double insulated products do not require a safety connection to electrical earth, preventing any failure from causing a shock, this feature teamed with quick connect terminals make the PCC30-60W Series easy to install and ideally suited for indoor LED lighting applications in residential and retail environments such as display cases, downlighting, backlighting, mood lighting and light sculptures.